Today, when you order "DirtBag� Classic - 8-Panel Footbag", you'll instantly be emailed a Penguin Magic gift certificate. You can spend it on anything you like at Penguin, just like cash. Just complete your order as normal, and within seconds you'll get an email with your gift certificate. Order in the next 5 hours 10 minutes and it will ship TODAY! 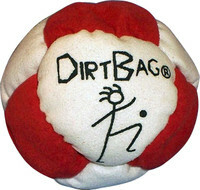 The DirtBag® Classic is made with a high quality synthetic suede and is loosely filled with..well..dirt! This gives it great stalling ability which will allow for easier, yet more complex play. The FootBag or "Hacky sack" is a small, round bag usually filled with either plastic pellets, sand (dirt), or metal ball bearings. Modern Footbags tend to be more loosely filled allowing for better stalling and handling. "Net" plays much like Volleyball where players will rally the Footbag (bump, set, splike) and volley it from side to side. "Freestyle" play is generally done solo. Players set up combinations of kicks and stalls to achieve a variety of tricks. "Circle Kicking" is the most common and popular type of Footbag play where a group of players form a circle and pass the Footbag around while performing tricks. Whether you're a serious player of just playing around, Footbag play is a great way to have fun, get in shape and build hand/foot communication. Please note that colors will vary. Feel free to contact us if you would like to request a specific color combination or to find out what colors are currently available.